The James Bond series hits an almost fatal low-point. 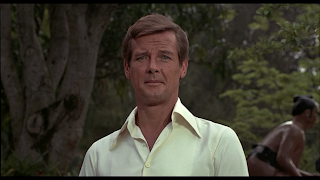 The Man With The Golden Gun is a witless adventure for Agent 007, the movie hampered by a limp plot and littered with low-grade and sometimes dumbfounding attempts at humour. Bond (Roger Moore) receives a death threat in the form of a golden bullet etched with "007". 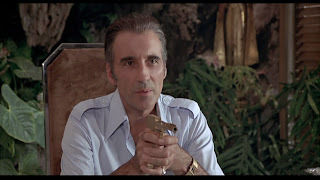 International gun-for-hire Francisco Scaramanga (Christopher Lee) is known to use golden bullets, and after Bond is relieved of an assignment to investigate a solar energy industrialist, he tracks down Scaramanga through a belly dancer in Beirut and a specialty weapons manufacturer in Macau. The trail leads to Scaramanga's mistress Andrea Anders (Maud Adams) in Hong Kong, promptly seduced by Bond much to the disappointment of local agent Mary Goodnight (Britt Ekland), a witless dumb blond. Bond uncovers a link between Scaramanga and Hai Fat, a Thai master criminal seeking control of a "solex agitator", a device that regulates solar power production. Hai Fat captures Bond, but he makes his escape with the help of local contact Lieutenant Hip (Soon-Tek Oh), despite the noisy reappearance of Sheriff J.W. Pepper (Clifton James). Scaramanga and his dwarf assistant Nick Nack (Hervé Villechaize) turn the tables on all their enemies and make an escape to a secluded small island base off the coast of China, where Scaramanga is converting solar power into marketable energy as well as ray gun weaponry. Bond has to infiltrate the island and thwart the plans of the master assassin. Almost everything in The Man With The Golden Gun misses the target. The plot is a messy byproduct of mashing the energy crisis of the early 1970s with the martial arts movie craze brought about by the Bruce Lee-inspired era. The grand evil plan is so unconvincing that the main villain himself has no interest in understanding it, the big reveal consisting of Bond rattling on about solar technology while Scaramanga dismissively admits that he cares for none of it. And the missteps continue. 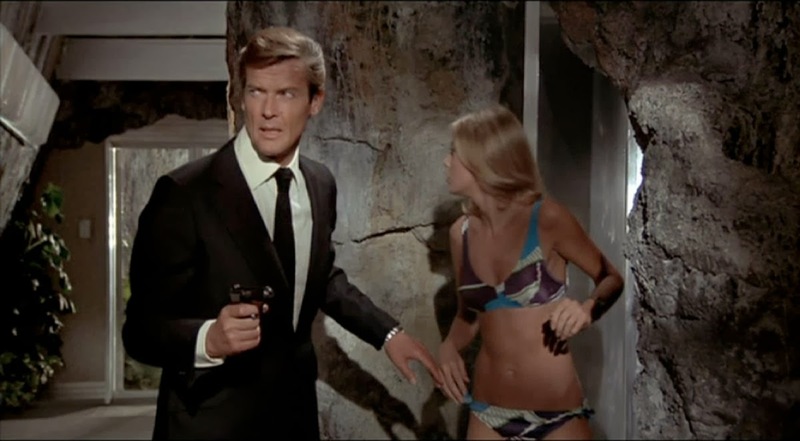 Britt Ekland ensures that Mary Goodnight looks great in a bikini, but Goodnight is the dumbest woman ever labelled as an agent in any movie, Bond or otherwise. Two giggly teenaged girls help Bond to escape from Hai Fat by defeating dozens of male student at a martial arts school. The title song by Lulu is easily among the worst in the series. And someone actually thought that bringing Sheriff J.W. Pepper back for another round of redneck humour after Live And Let Die was a good idea. And the one great moment in the film, an incredible flying car stunt featuring full rotation along the longitudinal axis, is incomprehensibly ruined. Director Guy Hamilton, mercifully helming his final Bond adventure, conspires with composer John Barry and producer Albert Broccoli to insert a comic slide whistle sound to accompany the stunt, degrading a dramatic technical achievement to the level of a cheap vaudevillian joke. The few good elements revolve around the character of Scaramanga, Christopher Lee bringing to life a world-weary killer who believes that there is little difference between his career and that of Bond. There are flickers of a better movie in the brief encounters between the two men, but these are trounced by the shoe-horned solar energy nonsense and a tired funhouse final confrontation. 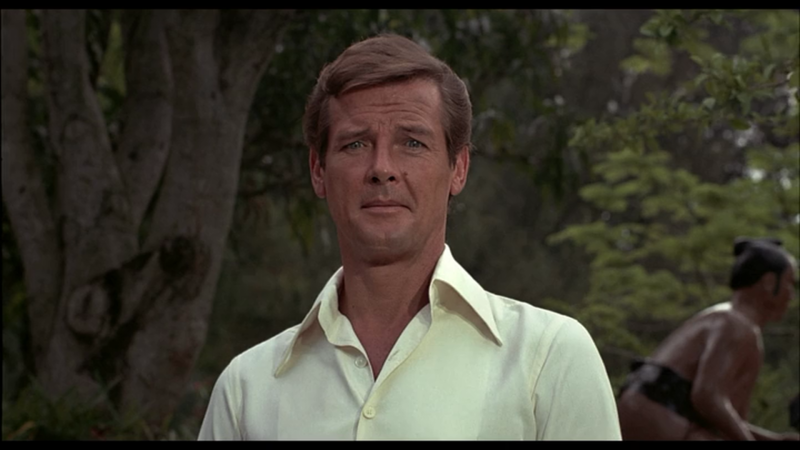 The poor commercial performance of The Man With The Golden Gun marked the end of the era of relatively cheap Bond adventures designed to cash in on the name with minimal effort. The trio of Diamonds Are Forever, Live And Let Die and The Man With The Golden Gun represent a creative trough that could have meant the end of 007. Fortunately Moore and Broccoli would persevere and regroup, steering the series towards a big-budget comeback three years later.